With the barista staff on vacation Tati & I are taking the barista shifts, enjoying the experience of a mom & pop business. Taking turns caring for the little man (Baby Jeremiah) and then as baristas. A few things continue to impress me about coffee culture in Lima. After two hours of serving customers I've only served one Mocha Capuccino, the rest of the drinks have been espresso and macchiatos. 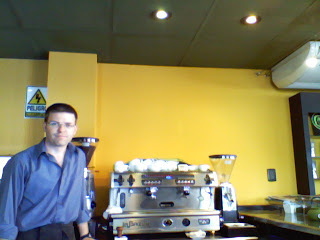 Espresso continues to be 30-40% of our total sales. It's been gratifying to see 100% Peruvian Washed Arabica Espresso be received so well. Secondly I've only had one customer (an American) ask for flavor to add to the drinks. Which is great because we do not carry any syrup. We only have 100% natural chocolate for Mochas, and raw coffee farm honey for sweetener. Lastly I've been thrilled to not have any issue with drink sizes. Only one size for each drink, with the largest hot drink at 7.5 oz, and cold drink at 12 oz. On the other hand we continue to get a lot of requests for food. I'm not talking about one more pastry . . . I mean people want eggs, meat turnovers, mini-pizzas . . .
On second thought maybe it's the lack of coffee culutre which has given us this haven to geek out on coffee how we want to.